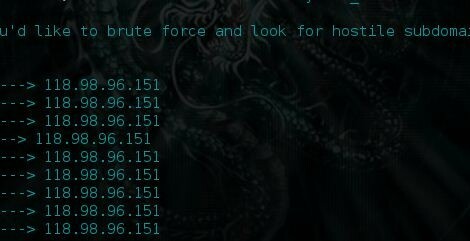 Browse: Home / HostileSubBruteforcer – Pure Subdomain Bruteforce. + if the 3rd party host has been properly setup. (for example if site.example.com is poiting to a nonexisiting Heroku subdomain, it’ll alert you) -> Currently only works with AWS, Github, Heroku, shopify, tumblr, blogspot/blogger and squarespace. There may be some false positives depending on the host configurations. puts getCode + " " + targetURI.green + " ---> " + ip_address + " "
puts "Enter a domain you'd like to brute force and look for hostile subdomain takeover(example: yahoo.com)"
← SprayWMI is a method for mass spraying unicorn powershell injection to CIDR notations.